After winning the Norwegian version of the American reality TV programme Top Chef in 2016, Reneé Fagerhøi has been able to fulfil a number of dreams, including opening her very own restaurant. “My passion for food has always been at the forefront of everything I do, but everyone knows that working as a chef does not provide a high salary. However, I was very lucky to be able to ‘speed date’ potential investors after this drive helped me win and show my skills to the whole of Norway,” the chef and restaurant owner recalls. Through these investors and supporters, Fagerhøi was able to secure a great spot right in the city centre of Trondheim. “It was important for me to open Bula on my own terms, and one important part of this was the choice of location,” she explains. The word ‘bula’ is common Norwegian slang for a low-key place to eat, drink, and socialise. With that in mind, the energetic and creative chef has well and truly succeeded in creating a place with a great atmosphere that complements the excellent food. This unique and fun spot has become an important part of Trondheim’s food scene. Decorated in a blissful mix of retro, kitsch and Art Deco, the vibrant look stands out from other restaurants in town. Even the toilets are an attraction in their own right. “I wanted to create somewhere people feel like home, and not a place that’s too stiff and uptight,” says Fagerhøi. “I like places that are a bit noisy and cluttered, places that have a rock’n’roll atmosphere where people can be themselves and enjoy their time. This was my aim for Bula.” Her interests in everything from interior design to music and culture shine through when you walk through the doors. The restaurant accommodates up to 50 seated guests, but the most exclusive and popular seats are directly in front of the kitchen island, with two round tables for groups to experience the magical energy oozing out from the kitchen. “Here, you can sit with the very best view into the kitchen to observe me and my team while we prepare your food,” says Fagerhøi. The kitchen itself is so open that you can see as far as into the very back, where the dishes are cleaned. “I simply did not want to hide anything. We are genuine and honest in everything we do,” the chef explains. And it is the sounds of the pots, those little moments of chaos behind the counter and the realness of the kitchen, that help to create a true and cherished atmosphere, which the guests appreciate when they come to visit. Bula is a relaxed eatery with high ambitions. 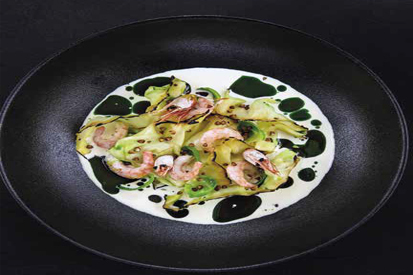 The food served is characterised by Fagerhøi as junk food mixed with classic dishes. “We collect inspiration from all over the world for our dishes, but I have a real soft spot for junk food,” she explains. Originally from Tønsberg, Fagerhøi grew up on a biodynamic farm where they only ate natural food and no meat. “We were self-sufficient with vegetables and had a traditional soil basement, a bit like a ‘70s collective,” she says. Junk food, however, was something she would never be served at a young age, and now her aim is to recreate the food she dreamed of as a child, with her own twist. This has resulted in dishes inspired by the fast-food culture but made with proper ingredients of quality, turning the food into pieces of craftsmanship. Together with the microbrewery Færder in Tønsberg, the enthusiastic chef has also been able to brew her own beer, served exclusively at her restaurant: Bulapilsen. “Bula is a very personal project for me, and I am so happy to be able to link it to my own heritage and where I grew up,” she says. In line with the secret theme, Bula also offers a secret room, hidden at the back of the restaurant. If you are looking for a truly unique experience and your own part of the restaurant for an evening, this can be booked out for groups of six to 12 people. The chef was inspired by the popular speakeasy concept of secret bar entrances through kebab shops and phone booths in New York, and wanted to bring this fun element to Trondheim. “We take you through the kitchen, behind the storage area and into the back, where the secret room is revealed. A bit like entering Narnia through the closet – it’s those little childish joys I want to recreate,” Fagerhøi smiles. In the new cookbook Fritter Shjiten, Fagerhøi connects her own childhood memories with music, film and travel experiences. 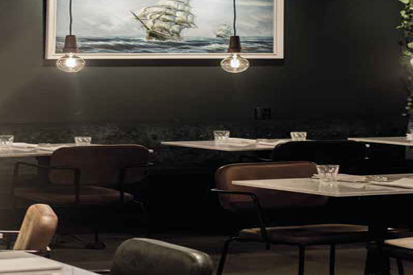 With this nostalgic backdrop, the chef has created old-fashioned dishes with a personal twist, classic dishes with a new presentation and a range of unique, exciting recipes. Her desire was to steer clear of the often effeminate imagery typical of many cookbooks written by women. “I wanted to make a cool and edgy book that links together different aspects of culture. Working in a kitchen is not all flowers and pink lipstick – it’s hard work!” Packed with small stories and delicious food, Fritter Shjiten is a tribute to an appetite for life. Along with the big success of her own restaurant concept, her own beer and now also the new cookbook, the young chef is always on the lookout for new, exciting adventures. In the near future, Fagerhøi plans on offering cooking courses to be able to share even more of her knowledge and passion.